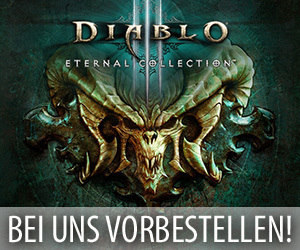 Im Verlauf des heutigen Tages konnten die Data Miner von „diablofans.com“ einen neuen Build für den PTR von Patch 2.4 ausfindig machen, der vermutlich bald auf die Testserver dieses kommenden Updates für Diablo 3: Reaper of Souls aufgespielt wird. Dabei besteht dieser neue Build bisher hauptsächlich aus Anpassungen an den Set-Boni von bestimmten Rüstungssets und den Fähigkeiten einiger legendärer Gegenstände aus diesem Action-Rollenspiel. 4 pieces: elemental attacks increase resistance to damage types by 25% (down from 100%) for 8 seconds. 6 pieces:Attacks increase your damage by 500% (up from 300%) for 8 seconds. At 4 stacks, each different elemental attack extends the duration by 2 seconds, up to a maximum of 8 seconds (reworked to extend duration after max stacks). 6 pieces:Enemies hit by your Mana spenders take 800% (up from 275%) more damage from your pets for 4 seconds. 2 pieces:While equipped with a melee weapon, all damage is increased by 600% (down from 1000%). 2 pieces:Reduce the cooldown of Earthquake, Avalanche, Leap, and Ground Stomp by 1 second for every 30 Fury (down from 40) you spend with an attack. 6 pieces: Increase the damage of Seismic Slam (added) by 800%. 2 pieces:Each time you hit an enemy with Punish, Slash, or block an attack your Thorns is increased by 25% (down from 50%) for 2 seconds. 4 pieces: You take 50% less damage for 20 seconds (up from 8) after casting Bombardment. 4 pieces: Furious Charge gains the effect of every rune and deals 300% (down from 400%) increased damage. 2 pieces:Your damage taken is reduced by 50% while Sweeping Wind is active (reworked from 50% for every stack of Sweeping Wing). 6 pieces: Lashing Tail Kick, Tempest Rush, and Wave of Light consume a stack of Sweeping Wind to deal 1500% (up from 1000%) increased damage. 2 pieces:When Haunt lands on an enemy already affected by Haunt, it instantly deals 60 (down from 120) seconds worth of Haunt damage. 4 pieces:Sentries deal 300% (up from 200%) increased damage and cast Elemental Arrow, Chakram, Impale, Multishot, and Cluster Arrow when you do. 6 pieces: Skills deal 600% (up from 400%) increased damage for every active Sentry. 6 pieces:Your damage is increased by 25% (down from 100%) for each enemy that is burning. Elites that are burning increase your damage by 250% (down from 1000%). 2 pieces:Spirit Generators have 100% (down from 300%) increased damage. 4 pieces:Increase the damage of Shield Bash and Sweep Attack by 600% (up from 500%). 6 pieces:Every use of Shield Bash or Sweep Attack that hits an enemy grants 50% increased Attack Speed and 10% damage reduction (added) for 5 |econds (up from 3 seconds). 3 pieces: 5% (down from 50%) bonus experience at level 70. 4 pieces:Gain 60% (up from 50%) damage reduction and deal 60% (up from 50%) increased damage for 5 seconds if no enemy is within 10 yards of you. 6 pieces: Your generators, Multishot, and Vengeance deal 20% (up from 15%) increased damage for every point of Discipline you have. 4 pieces: While Toad of Hugeness is active, you take 50% (up from 40%) reduced damage. 6 pieces:Increase the damage of Blessed Hammer by 1250% (up from 750%). Aquila Cuirass: While above 90 – 95% (up from 75-85%) primary resource, all damage taken is reduced by 50%. Justice Lantern: Gain damage reduction equal to 45 – 55% (down from 50-65%) of your Block Chance. Oculus Ring: Damage is increased by 70 – 85% (up from 35-40%) while standing in the area. Lord Greenstone’s Fan: Every second, gain 80 – 100% (down from 250-300%) increased damage for your next Fan of Knives. The Twisted Sword: Energy Twister damage is increased by 125 – 150% (up from 75-100%) for each Energy Twister you have out. Deathwish: While channeling Arcane Torrent, Disintegrate, or Ray of Frost, all damage is increased by 30 – 35% (down from 75-100%). Fazula’s Improbable Chain: You automatically start with 40 – 50 (up from 15-20) Archon stacks when entering Archon form. Zoey’s Secret: You take 8-9% (up from 6-7%) less damage for every Companion you have active. Lakumba’s Ornament: Reduce all damage taken by 6% (up from 5%) for each stack of Soul Harvest you have. Bracer of Fury: Heaven’s Fury deals 150 – 200% (down from 300-400%) increased damage to enemies that are Blinded, Immobilized, or Stunned. Akkhan’s Leniency: Each enemy hit by your Blessed Shield increases the damage of your Blessed Shield by 15 – 20% (down from 25-30%) for 3 seconds. Fortress Ballista: Attacks grant you an absorb shield for 2-3% (down from 4-5%) of your maximum Life. Etched Sigil: Your Arcane Torrent, Disintegrate, and Ray of Frost also cast one of your (reworded) other damaging Arcane Power Spenders every second. Boyarsky’s Chip: Adds 16000 (down from 30000) Thorns. Bei diesem Build geht es eigentlich nur darum, dass die Items nun richtig dargestellt werden. Die Änderung an den Items an sich ist bereits seit dem 02.12. auf dem PTR, jedoch zeigten die Items noch die alten Stats an.